When mathematics makes sense, each piece seems to fit together. There’s no question about how to do things, because it’s all natural. This is what happens when you become good at algebraic manipulations. No matter how hairy the expression, you’re able to deal with it. Double-decker fractions aren’t frightening. Sure, it might be tedious to work through, but it’s doable. It’s sort of like strolling through a path in a meadow. Nothing is blocking you, and the way forward is clear. Contrast this to when mathematics doesn’t make sense. When this happens, it’s like trying to navigate a minefield. Each step is uncertain. You worry about how one wrong move will ruin everything. Both experiences happen to everyone. There are times when learning goes smoothly, and times where it is anything but smooth. Of course, some people experience one side of this coin more than others. For those that find mathematics to be a minefield on average, it’s not surprising that they will grow to dislike mathematics. If I had to do something which made no sense to me every single day, it wouldn’t take long before I became frustrating with it, too. The question then becomes: how do we move the needle so that more people find mathematics to be something they understand? I want to be clear here that I’m not saying those who enjoy mathematics don’t experience any difficulties. There are times when the concepts are challenging. However, the difference is that they have enough forward momentum that they keep on pushing through the difficulties. To solve this problem, I think there are two related points that need to be addressed. The first is that mathematics needs to make sense. I would say this is one of the most important aspects of teaching that we don’t emphasize. Mathematics isn’t a bunch of random rules that we need to memorize and apply in just the right way so that the answer is magically spit out. Instead, mathematics is built on a few key rules (axioms) and uses logic to build more complex structure. This means you don’t need to memorize everything. By knowing a few key rules, you can branch out and do a lot more. Furthermore, you should be able to connect what you’re doing back to those axioms. The way we mess this up is by chopping ideas up into these arbitrary categories that make the concepts seem distinct, even though they aren’t. The most egregious example that comes to mind is the insistence in secondary school to show students how to solve a system of two linear equations by using elimination, substitution, or comparison. These methods are presented to students as different ways to solve an equation, but it’s often not pointed out that these are essentially doing the same thing. Sure, the methods might be slightly different, but there’s not much separating them. After all, comparison is just a special case of substitution, and elimination isn’t that much different either. What’s the key insight here? Instead of focusing on three arbitrary “methods” to solve a system, the main emphasis should be on the fact that you can do basically anything to an equation, as long as you do it to both sides. That’s the key insight, not these three arbitrary methods. When we emphasize different methods and forget to mention how they are all similar, students can get confused and think that you’re only allowed to use certain ones depending on the situation. I know this because I’ve worked with students who had this impression. It’s no fault of their own, because these methods are listed as distinct. Why should they expect them to be linked? The second is that we need students to take small steps. If you’re like me, you’ve tried to work through a problem or a piece of mathematics and became confused when an author suddenly took a large step. The result is that you become disoriented, since the step was too big for your tastes. This can happen to everyone. We all have our own preferred pace in which to tackle a problem. As such, it’s no surprise to me that the “default” step size which is present in textbooks and in teaching practices can be too large for some. The result is that some students become bewildered and are unable to follow. And since a classroom isn’t often made to suit the needs of one student but of thirty, it means they can be left behind on the mathematical journey. For the student, the only way to catch up is to take what is said as a given and just commit it to memory. Instead of going over each argument in detail and thinking about it, they have to accept it without further investigation. This reinforces the notion that mathematics is a bunch of facts that need to be accepted, instead of a series of reasoned arguments. Who can blame a student for holding this view when they have been left behind? This is both an easy and a difficult fix. It’s easy in the sense that we know how to help the student. They need to sit down with the material and go through it at their own pace, taking steps that seem reasonable to them. I often catch myself going too fast when working with a student, and when I do I try to slow down, because the explanation isn’t for me. It’s for them. On the other hand, the fix is difficult because teachers can’t give each student this opportunity at all times. The reality is that a classroom is made to serve many students, which means the time each one gets with the teacher is limited. As a tutor, I get the opportunity to work with the students on a one-on-one manner. This helps, but not everyone has access to a tutor. The best advice I could then give to a student is to see after class if they can go through the arguments that were presented in class. It’s during this time where they can see if the steps taken were acceptable. If not, the student needs to work through the confusion, or else they will be forced to accept the results without understanding them. 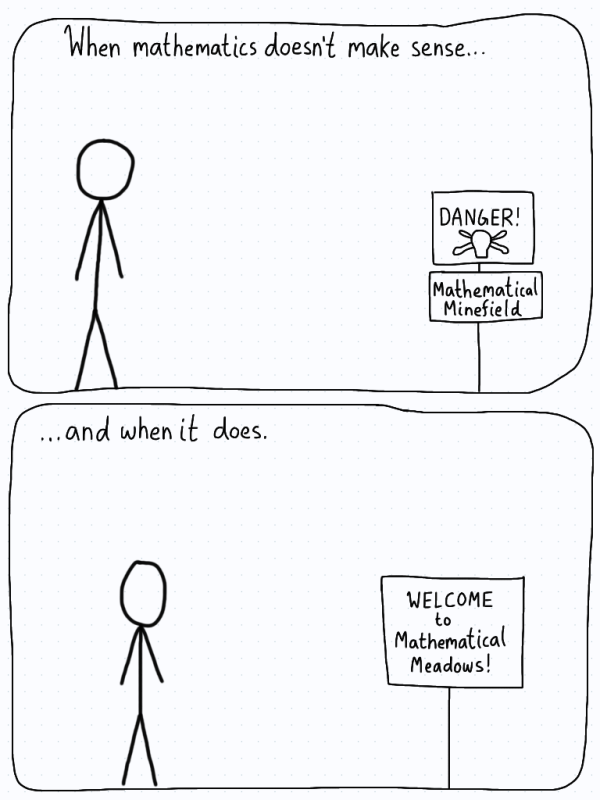 The unfortunate reality is that I see students who look at mathematics as a minefield, with every step an uncertain one. The reason this happens is because we’ve taught them to value facts over the arguments that link those facts. It’s the links which are so much more important, but since they aren’t emphasized on exams, students don’t internalize them. The result is that a student might get good marks, but this doesn’t mean they understand the mathematics. My goal as a tutor is to help bridge this link. Instead of getting students to take big, uncertain steps through what looks like a minefield, I want them to take smaller steps through a meadow. At its core, mathematics is understandable. We just need to stop focusing on the results and more on the underlying mechanisms.